Private walking tour through the famous Paseo del Prado street, where we will be learning about its development and about those responsible for its existence! So, of course we will meet King Carlos III, pay a visit to the fountain of Cibeles, the symbol of Madrid, will see the fountain of Apolo or Loyalty square, nearby the congress, and, of course, the three main Madrid Museums, Prado, Thyssen and Reina Sofia. A walk through history that will later on have its reflection on the art masterpieces, the visitors will enjoy inside the museums with our special bono pass skip-the-line for the three museums! The bono can be used on separate days. 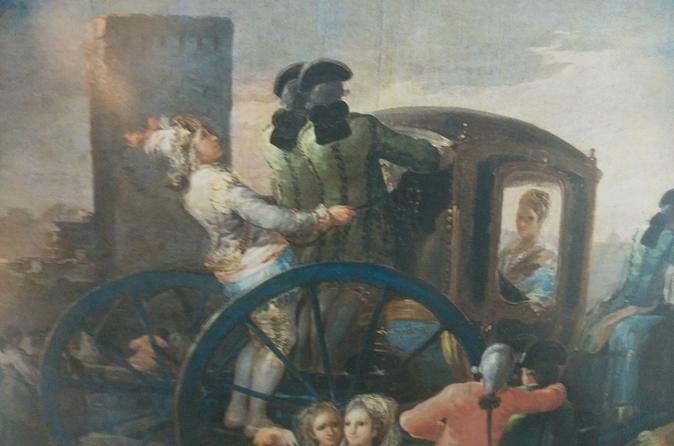 This tour is for those visitors that are interested in art and history, and are curious to get to know the three most relevant museums of Madrid which happen to be amongst the best in the world, in a framework of a historical overview of the area. The three most prominent museums of Madrid are located on the Paseo del Prado Street an iconic area of the city that today holds what in Madrid we call the Art Triangle. Each museum has its own significance and of course its own collection. The private collection of Baron Thyssen-Bornemizsa, that runs from medieval ages to the 21st century, one of the most distinguished galleries in the world holding a very important collection of American painting, the Prado Museum, which covers medieval art, great significant flemish paintings, some of the outstanding geniuses of the golden century like Diego de Silva Velazquez, an impressive collection of nineteenth century mostly Spanish paintings. To conclude the art journey, why not visit Reina Sofia contemporary art museum to understand the latest evolution of the art. Do pay a close and cautious look to probably the most significant piece by Spanish genius Pablo Ruiz Picasso and his masterpiece El Guernika. You will visit the museums on your own, but this tour will be a great historical and cultural introduction to the wonders of art by one of our expert local guides in Madrid. The tour will transport you to the 18th century and help you put into context events and personalities that led to the creation of one of the most world wide relevant art concentrations ever! Let's make a journey together to understand and to get to know this gorgeous area of Madrid and its secrets!